Chucky's Fight – A CHARITY DEDICATED TO FIGHTING TEEN SUBSTANCE ABUSE! A CHARITY TO HELP KNOCKOUT SUBSTANCE ABUSE! These videos tell Chucky's story and will help you understand the cause. Chuckys Fight shared a post. Below are some of the ways we help Teens, Families and Communities to help fight Substance Abuse! We will come to your school or organization to talk to the kids about the the negative effects of substance abuse. We will not only educate them, but will help build a support system for those that need more help. We work with families to help loved ones work through issues that might impact them. Whether it is immediate family or relatives, we will help and educate everyone get through this together. We can help find a place to bring your child to get the help they need. We will work with them on their progress and mentor and guide them back to safety. Chucky started a cooking clinic to help kids learn how to cook and appreciate how fun it is to make your own food. We help get teens involved within the community to help keep them active and on a positive mindset. We will do whatever we can within our power to grow and develop teens that need guidance and direction. DONATE AND HELP EDUCATE AND EMPOWER YOUTH TO MAKE HEALTHY CHOICES! All donations go directly to helping the kids and families get the education and treatment they need! 100% of the money raised is distributed to organizations that help educate teens and their families on the dangers of drugs and alcohol. Many of these organizations have programs that educate teens by providing healthy activities which replace and detour them away from experimenting with illegal substances. 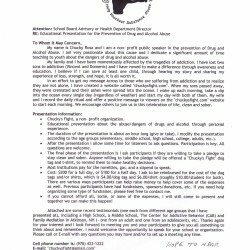 Chucky gives presentations at various schools and organizations, telling his story about his family’s fight against teen substance abuse. We are always looking for folks to come join Chucky with a plunge into the Ocean. Make it a family day with your children or even bring a friend, co-worker, or sponsor a work group to come jump in the ocean as a team building project. Today you came to my school and talked to us and I just wanted to say thank you! Over the summer I had several friends pass from overdose and for some reason it wasn’t enough to make me quit using. Today something you said, i’m not sure what, but it made something click in my head and today is the first day in nearly 7 months that I haven’t smoked. When I got home I smashed my pipe and tossed away everything drug related that I own. I’m not saying this is permanent but thank you for helping me make the first step! I hope to do the plunge with you very soon. Thank you so much for coming to my class again this year. In the short period of time, you taught us something that couldn’t be taught in a lifetime. You are my inspiration. With everything that you have been through and have the amount of emotional strength to tell your story over and over, it’s just amazing. You really did open my eyes with drugs and alcohol. You have made me want to stop with the drugs and alcohol for the first time in a couple months. 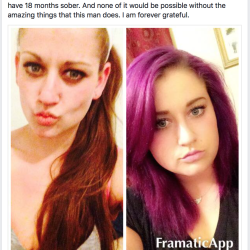 I had a sober weekend! You were my motivation to stop trying to fit in with the ones around me and you gave me the courage to say no. I just want to thank you with all of my heart for teaching me so much and for giving your time to come visit us. So again, thank you so much and stay strong! Dear Chucky, thank you very much for sharing your story to me and my class. It had a lot of meaning behind it. I thought it was really good to tell of you jumping in the ocean, it showed how close-up alcohol and drugs can affect someone. I also liked the coin. I think it was a good idea and a lot of people, including myself, will use it. Thanks again!